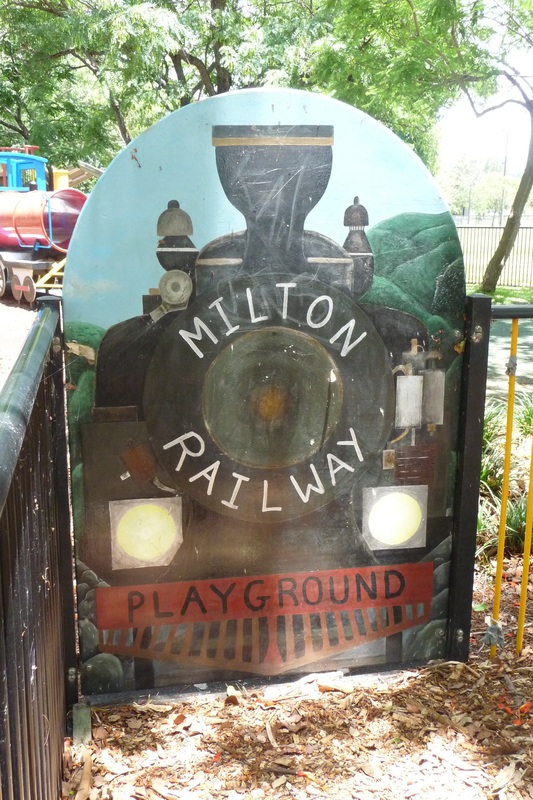 The Milton Railway Playground is a terrific spot to take little people. There are picnic tables and a BBQ as well as a basketball court and a field where you could play cricket or football. The main attraction for younger kids is the playground. As well as the traditional swings it has a very heavy duty hammock, a little pretend ice-cream/coffee shop and petrol station and a steam train for little people to climb on. This hammock looks like it could withstand a lot more swinging on than the usual fabric kind. There is loads of scope for imaginative play and it kept my daughter entertained for a couple of hours. My son also saw his first real train on the nearby train line visible from the park which added extra excitement. There are benches in the corners for a quiet sit down in the shade to sit and eat, breastfeed or watch your kids. Possibly the best part is that the playground is fenced,so it is easy to keep track of younger kids if they run off. It's definitely worth a visit.